The Ceres Temperance Hall stands on the hill at the corner of Wheatsheaf Street and McCann Street in the Village of Ceres and was built in 1862. It has three heritage lights down the north wall. Inside it has a timber floor and a cathedral ceiling of timber as well. The walls are very thick sandstone blocks acquired from local quarries. It has a history of community use with Temperance meetings, dances, luncheons, concerts, community evenings, birthdays, anniversaries and many other communal gatherings over the last hundred and so years. The pride of the Ceres Village it alone remains standing after the three sandstone inns, built in the village in the 1850s have long since gone. No doubt The Wheatsheaf, The Rising Sun and the Barrabool Inn would have such tales to tell had they remained. The Ceres Hall remains a Temperance Hall; no alcohol is allowed through its doors. The code of the Blue Ribbon Society still hangs in the back room. The Hall has sound acoustics as many of the Gilbert and Sullivan Light Operas have proved. 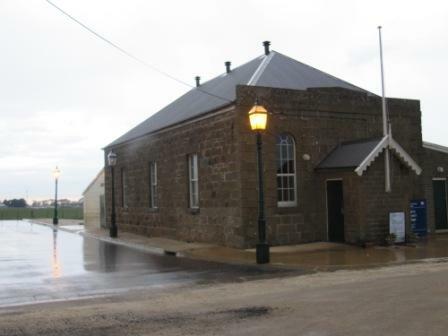 The Ceres Temperance Hall has been home to countless productions over the last 28 years (see Past Performances) and each performance has been imaginatively staged in this historic and much treasured heritage building. The timber floor and high timber ceiling together with the thickness of the sandstone blocks make sure of that.